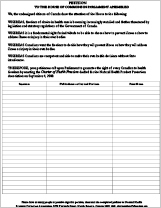 Join the over 96,800 Canadians who have already signed the petition and help us send a crystal clear message to the government that, as the people of this country, we want change in the laws that govern natural health, natural health products (NHPs) and the ability to think for ourselves. 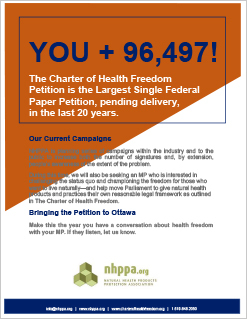 We want the Charter of Health Freedom to become part of Canadian law. Take it to work, school, your neighbourhood, family events, social clubs, community events, parties, sports events, your house of worship, shopping, and the doctor’s office. That’s all you need to make one petition count. Watch so all the right information is entered. 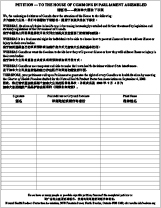 Don’t sign it twice! 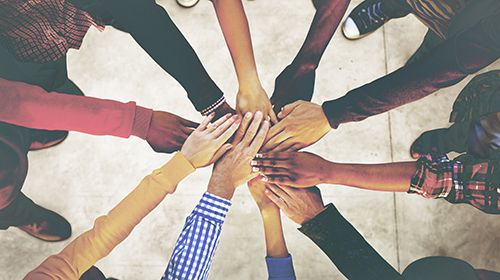 Why Should I Support the Charter of Health Freedom? The Charter of Health Freedom would stop the current regulatory crisis. It could end the criminalization of our natural health industry. It is the only real solution in Canada to the legislative crisis in existence today. Check out our one page review of The Charter for more. In the Spring of 2018, Health Canada published a timeline for regulating NHPs in the same way as chemical pharmaceutical drugs. Between the Fall of 2018 and early 2020, the landscape of NHP regulation in Canada is going to dramatically change. This will lead to a further loss of NHPs, further censorship of truthful health claims, the risk of losing traditional medicines and therapies and, ultimately, poorer health outcomes for all Canadians. 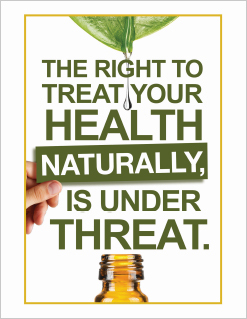 If you think the current state of our natural health industry Regulations is wrong, and you think it takes away people’s freedoms, we ask you to sign the petition. The dismantling of the industry is the inevitable result of the NHP Regulations as they are currently written. Absolutely. 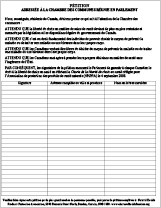 In 2008, NHPPA along with other natural health advocacy groups and their supporters created enough public pressure to put a stop to Bill C-51, and we can do it again with your help. If you’ve been an armchair activist and have found yourself commiserating with friends, family and co-workers, do yourself and your country a big favour and act democratically. Politics, law and science are all very exciting because it’s real life drama! Writing to your MP can be an effective tool for change and the more MPs hear about an issue from their constituents, the more likely they are to take action. MPs often tend to judge that there are many other constituents that feel the same way if they receive just one letter on a certain issue. Emails are just as effective as a letter sent by post as Parliamentary staff handle them in the same way. When you pen your letter or email, KNOW that it is speaking for many others. Learn more about how to write to your MP. Or, find out more about other ways you can get involved with our “8 Action Steps” handout. For more information, you can read our one-page review of The Charter Petition. 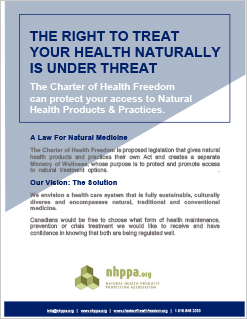 We appreciate your support of The Charter of Health Freedom, and your commitment to ensuring Canadians’ right to access Natural Health Products and Practices is protected by law.